Scholars and historians believe author Elizabeth Willis De Huff was born around 1886 in Augusta, Georgia to John Turner and Ann Boyd Wilson Willis. She became a teacher and followed her husband to Santa Fe, New Mexico, where she quickly became fascinated with Native American folklore. Her husband was the superintendent of the Santa Fe Indian School and when the Bureau of Indian Affairs said Native students were forbidden to learn the arts, she began teaching art classes. While working with Hopi and Pueblo students, she decided to write down the Native American folktales. The resultwas her first book, Taytay’s Tales, published in 1922. 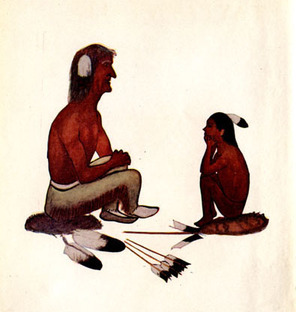 The book featured artwork from her students Fred Kabotie, a renowned Hopi painter, and Otis Polelonema, a painter and artist of the Hopi second Mesa. De Huff eventually back to Georgia after her husband died in 1945. She passed away in 1983 leaving behind the Elizabeth Willis DeHuff Collection of American Indian Art, a collection with more than 55 Native American artists.